SureStep is the most effective means of providing stability to children who pronate when standing and walking. 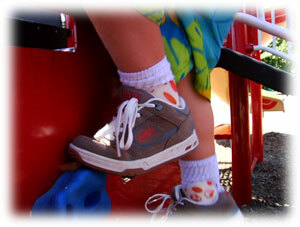 This patented, dynamic system allows children to gain stability, while still allowing normal movement and function. Children with low muscle tone who have trouble with stability due to pronation can now walk, run and jump without the delays and instabilities that often result. SureStep is not a different brace, but rather a completely unique system that manages the foot and ankle without over-managing. Until now, custom orthoses have always required casting which is messy and often traumatic to smaller children. SureStep is not only conceptually unique, but also unique because it requires no casting. Nine simple measurements provide all the necessary information to create the model of the foot and ankle over which the SureStep is custom fabricated. This means that no matter where you are, SureStep is available to you. If you are tired of chasing red marks, pressure areas, calluses and blisters, then SureStep will be a welcome change. The frequency of skin irritations normally associated with custom orthoses reduces dramatically with SureStep. This is due in part to the softness and flexibility of the material used to create the SureStep system. The plastic is approximately the thickness and consistency of a plastic milk jug. This allows the orthosis to "flex" with the foot without applying undue pressure to the navicular, malleoli and metatarsal heads. "As an orthotist and a father of a child with low muscle tone, I was determined to provide the best orthotic treatment regimen for my son Kevin. When Kevin was younger, I fabricated a variety of orthotics for his severely pronated feet. Some restricted certain activities like jumping; some made his legs tired and sore; some gave him blisters and callused areas; some just simply slowed him down. Frustrated by the functional limitations created by traditional rigid bracing made of hard plastics, I pursued the creation of a lighter and more flexible device that would allow and even encourage normal development of a child’s gait without decreasing function."